For more Monday harvests go to Daphne's Dandelions. I'm picking all my bells at the green stage now too - they just take too long and I am ready to rip them out! I have picked my bells green this year too. There are not many in the garden this year and I have picked them as needed so no time to turn red. Yours are lovely. My red bell peppers haven't flowered this year yet. LOL! They maybe too late! I guess next year I'll have to remember to start those seeds earlier! Great looking peppers!! I hate waiting for peppers too! They take forever. I always wonder how they get them to turn so fast for the supermarket. bell peppers are such a pain! They take too long! My friend grew some sweet red peppers that tasted pretty much like bell peppers, but had a slightly different shape. They started turning red in July! I'll find out what they were called and let you know. I'm going to grow them next year for sure! Yes, peppers take so long to turn red. But they are so worth the wait. when they turn red their flavor intensifies and their sweetness increase. As long as your days are warm give some of them a chance. You won't regret it. Forget about them for a few days and they'll change! 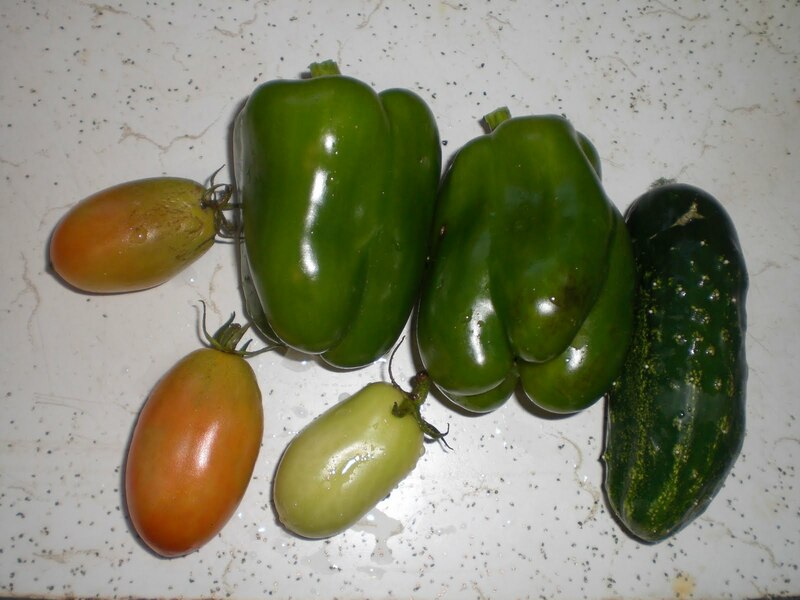 Now you know why green bell peppers are so much cheaper than the colorful ones! Actually, green bell peppers are one of the few peppers that I don't like, too "green" tasting and they come back at you for hours after eating them, yuck. It's worth the wait for ripe ones if you have the time. I can see how those bell peppers tease you and and test your patience. Sorry they are not turning color, but at least they are beautiful and well shaped and sized! Are the plants staying pretty healthy, like they could stand to be in the ground for a while longer? This year's wait for the peppers to ripen is excruciating because our summer was soo cool - and peppers need warm (especially night temps) to ripen. I have a bunch of peppers I have been just letting go in the hopes they will eventually ripen up . I have trouble waiting for the red to show up on my peppers too. I do wait though. I'm not a big fan of green peppers, but love the red ones.